Pixel Inspiration’s web based Content Management system works with many of the leading Digital Signage platforms including CoolSign and Scala and their latest upgrade enables clients to update their digital signage network using Twitter. The newly added functionality allows authorised users to send a private tweet, instructing their signs to update with new content. With twitter apps being available on virtually every smartphone platform, this latest update provides users without easy access to a desktop PC with the ability to easily control their digital signs. The system is not simply a twitter feed, instead it provides advanced granular controls to associate each twitter user with one or more screens, content items, templates and fields. This means that everything from simply turning content on and off, to updating a content field, such as a product’s price point, is now possible from a mobile device. 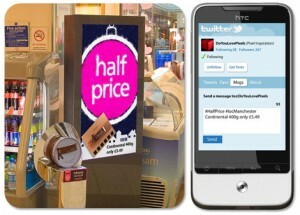 1 Comment To "Control Your Digital Signs With A Tweet"
Great work Nikk. Is that worth an innovation award?